With Samsung and Huawei flagship smartphones now launched, many Android fans are now anticipating the launch of the next OnePlus flagship smartphone. 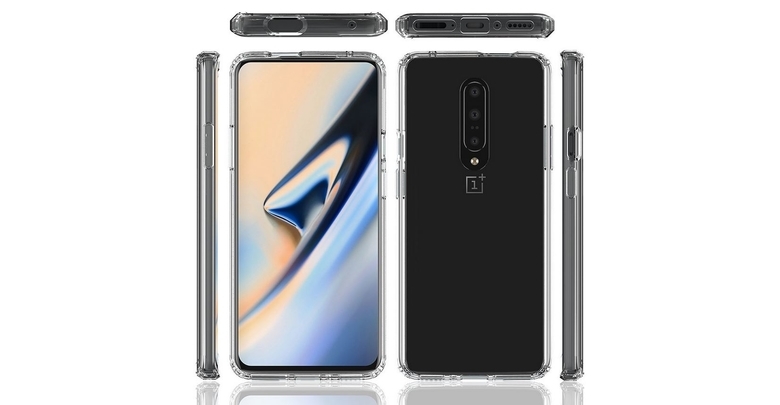 Alleged case renders showing the upcoming OnePlus 7 have now leaked online, revealing a refreshed design with a notch-less display and upgraded cameras. The case renders suggest OnePlus’ next flagship device will not have any notch or a punch-hole cutout for the selfie camera in the display. Even though the renders do not actually show a pop-up selfie camera, it is highly likely that the smartphone will have one. OnePlus flagship smartphones have usually been based on OPPO’s high-end R series devices. Since OPPO’s latest F series and upcoming Reno series smartphones have a rising selfie camera, we can be fairly certain the OnePlus 7 will have a similar rising pop-up camera. Apart from a notch-less display, these new renders also show a triple-camera setup on the back of the phone. This is hardly surprising, however, as triple cameras seem to be the new trend in the flagship segment this year. Apple too is rumored to equip at least some variants of its iPhone 11 and iPhone 11 Max with triple cameras at the rear. Additionally, the renders show a repositioned SIM card tray as well as a power button placed towards the top of the phone. Just as expected, a 3.5mm headphone jack is nowhere to be seen. Just like nearly every other 2019 Android flagship smartphone, the OnePlus 7 is going to have a Qualcomm Snapdragon 855 chipset running under its hood. Since OnePlus has already released the OnePlus 6T McLaren Edition with 10GB of RAM, we can be certain that the OnePlus 7 will arrive with at least an identical amount of RAM in its top-end configuration. And while the OnePlus 7 is not expected to have 5G connectivity, the company will launch a 5G smartphone sometime in the second quarter of the year.